Informații complete sunt disponibile pe site-ul www.noapteagaleriilor.ro si pe aplicația de telefon NAG (disponibilă pentru Android și iOS). On Friday, 5th of October, we meet for The White Night of the Art Galleries! A new edition of The White Night of the Art Galleries invites the public in the participant cities to cover a night journey in the company of contemporary art! Opening days, performances, alternative spaces, art galleries, and artist studios, all together generate each year a new map of the cities in which this event takes place. Prepare yourself for a cultural journey on Friday, 5th of October starting with 19:00 until late at night in the cities: Bucharest, Arad,Brașov, Cluj Napoca, Craiova, Iași, Miercurea Ciuc, Petrila, Reșița, Sfântu Gheorghe, Sibiu, Târgu Mureș and Timișoara! 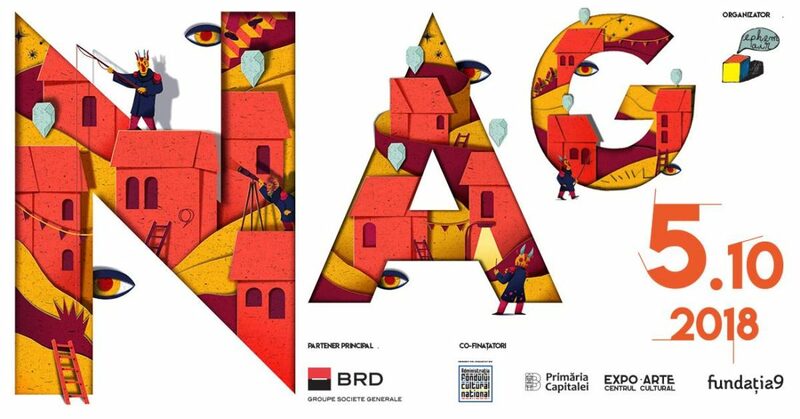 NAG National program initiated and coordinated by Ephemair Association is developed with the support of BRD Groupe Societe Generale in the participant cities by their local partners. In Bucharest the cultural journey will be brought to you by more than 70 participants like art galleries, cultural institutes, alternative spaces and artist studios. Details can be found on www.noapteagaleriilor.ro and on the telephone app NAG (available for Android and IOS).